Are You Living Life On The Outside? Real belonging requires us to be authentically ourselves. People who grew up with CEN end up feeling on the outside. It’s a sense of being alone, unable to join, separate, different. This feeling is compounded by the fact that the cause of it all, Childhood Emotional Neglect, doesn’t get talked about. The Story: In the Boston Globe, a headline says, “For Neglected Children, Path to Recovery is Difficult.” The article is about a house in Massachusetts in which two children, one 3 years old and the other 5 months, had been hidden away from the world by their mother. No one, not even the children’s father, knew that they even existed. They had been traumatically physically neglected. In the article, Dr. Charles Nelson, a Harvard professor, is quoted as saying, “Depriving the brain very early in life has very insidious effects.” Dr. Ann Easterbrooks, a Tufts University professor, is also quoted: “In cases of chronic, severe neglect, you see smaller brains and difficulties in emotion regulation. You might see serious depression, anxiety disorders, and negativity,” including blunted positive emotions and emotional flatness. The Takeaway: We know, and science has established, that extreme physical neglect in childhood affects the brain’s wiring, and has severe and damaging effects that endure into adulthood. But this article, and the research it cites, focuses upon physical neglect, not Emotional Neglect. The Question: Let’s study the brains of Emotionally Neglected children. 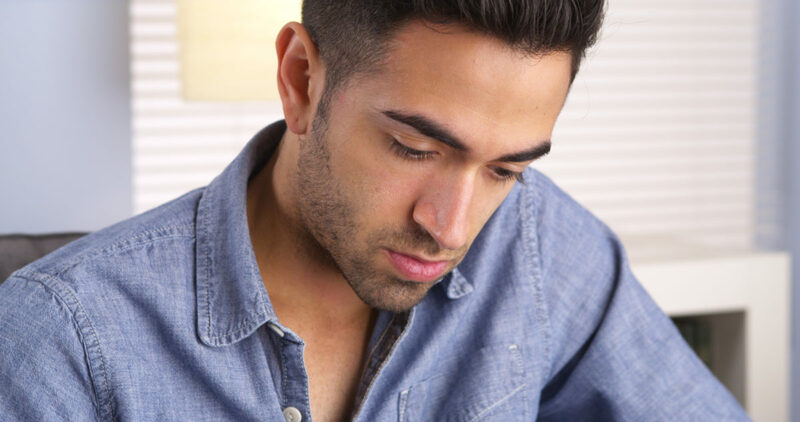 Let’s look at the separate effects of Emotional Neglect from the physical type of neglect. The Story: The Monitor on Psychology (Jan., 2014) referred to a study by psychologist John Cacioppo,PhD from Social Science and Medicine, 2012. The study found a connection between feelings of loneliness and increased likelihood of death. They also found that feelings of loneliness were unrelated to marital status or the number of relatives and friends nearby. In other words, being alone is not a health risk. Feeling lonely is. And it is possible to feel very alone, even when surrounded by family and friends. The Takeaway: Loneliness is a feeling, not a state. It is possible to experience powerful feelings of loneliness while surrounded by people who love you. And beyond that, those feelings of loneliness can have a profound effect upon your physical health. 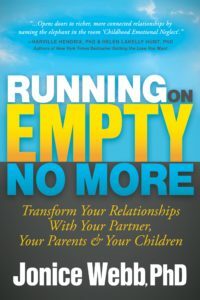 This study validates the importance of the empty, “on the outside” feelings that so often go along with CEN. The Question: The deeper question is: Why would a person feel lonely while surrounded by people who love him? I believe that often, the answer is CEN. So is it a jump to hope that taking on your CEN and breaking down your walls could improve your physical health? I don’t think so. The Story: A study by O’Reilly, Robinson and Berdahl, 2014, looked at the effects of workplace ostracism (being excluded or ignored) vs. bullying. They found several very interesting and relevant findings: First, they found that office workers view ostracizing a co-worker as more socially acceptable than bullying him/her. But surprisingly, they found that ostracized workers suffer more than bullied ones, and are more likely to leave their job than their bullied colleagues. The Takeaway: If grown-ups are more affected by being ignored (the adult form of Emotional Neglect) than they are by bullying (the adult form of abuse), imagine what it’s like for a child who is being ignored by his family. The Question: Could this have implications for the impact of abuse vs. 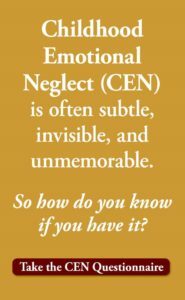 Emotional Neglect upon children? Abuse is a terrible thing for a child to endure. It has lasting effects throughout adulthood which must be addressed. But if you grew up emotionally neglected, you may suffer even more than the abused. You, like the ostracized adult in his work environment, did not feel like an important part of your family. Your suffering is real. So children’s brain development is effected by physical neglect. It is possible to feel intensely lonely while surrounded by loving people. And being ignored is worse for adults than being bullied. Yet widespread, subtle Emotional Neglect continues to erode the lives of thousands of children and adults. Unfortunately, since it is not visible, tangible, memorable, or dramatic, it receives no headlines and no research grants of its own. What is it like to fall between the cracks? What is it like to feel that you don’t belong? Let’s pay attention to the children who know. Let’s ask the adults who can tell us. Let’s put our time and money into research, and give validation and a voice to those who feel on the outside. 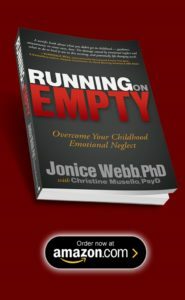 To learn more about Childhood Emotional Neglect, its causes and effects, and how to heal, see the book, Running on Empty: Overcome Your Childhood Emotional Neglect. Just a random thought. I just found your webpage thanks to a post on facebook a few days ago. While I’m skeptical of everything, this rang so true to me. I’m excited to get your book and start learning more about this. The question I have. Have you noticed this more prevalently in the youngest child of the family? I only ask because I notice so many people around me who are the youngest seem to have similar feelings to what I have experienced over the years. Most recently, when we moved, a new little 6 year old boy who started playing with my son seems completely neglected due to a 10 year gap between him and his next oldest sibling. He often comes to our house bored that no one will play with him at home. At first we were a bit annoyed to be the default babysitter for him. but then we learned, at 6 years old, he can’t read. As time progressed, I got a position in church working with youth. His older siblings seem well connected and well adjusted, much more than him. My wife and I decided we were going to provide what we could and give him a safe place to come play whenever he needed it since it didn’t seem like he was getting it at home. I see a lot of his life in my own and feel so bad for him. I am the youngest and feel like at 14 I was raising myself. My older siblings were long gone to college and marriage and I was home alone while my parents traveled the world. Don’t get me wrong, I lovvved the freedom to roam at will. But I was always lonely. And I still am. Thank you for your work! I am very good looking. I walk down the street, people admire me.It is fun. I enjoy cheering people up just by walking down the street and tipping my hat and head just so for them. But, due to early childhood abuse, I cannot fit in. It isn’t just because I happen to have landed somewhere, where, once again, I am better looking than most, it is because I truly feel like an alien here on this earth. I do not fit into my family or fairly recently, my state, or even the USA. I hang on to life here on this earth because I have trapped myself here, deliberately, and I enjoy the love of my spouse, my child and our pets, but I am just now recalling the early years of abuse that blossomed into decades of abuse at the hands and mouths of those who are my genetic family, and I wonder just how many of those who abused me knew they were giving me a horrible gift: the will to die? I am fighting it, but this horrible gift has taken out several of my peers and many a great rock and roll singer, and a beloved cousin very recently. Why did I survive? Why am I here? I am Generation X. Age 48, and I was born to be abused and then to die early. How does one escape that when so many of us in Gen X were raised the same way? I know that you use the “walls” metaphor for loneliness but I feel invisible. Completely out in the open but just not significant. No amount of people, no venue and no time of day or night changes that feeling. I don’t think there is a place for the this but I will ask anyway. I was wondering if you could further elaborate how “breaking down walls” occurs in good therapy. I know you have examples in your book but I mean more incrementally. What milestones should a patient / client look for on the way to recovery? What is recovery? What protocols have you developed to address this? Again, I know a comment section is not the place for this but maybe there is more technical information online. I added this question to the list of questions for the Q&A Calls. I’ll talk about this on a call sometime soon.